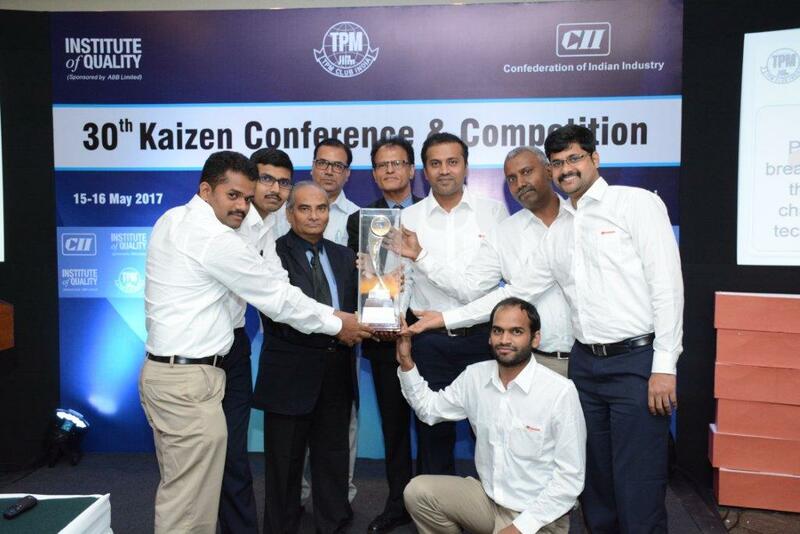 Toyota Kirloskar Motor (TKM) was honored with “Best Kaizen Award” by Confederation of Indian Industry (CII) at the 30th Kaizen Conference & Competition held at the India Habitat Centre, New Delhi on May 16th 2017. Toyota was awarded under the “Breakthrough” category, for initiating innovative practices to reduce energy consumption at the paint booth in the company’s world-class manufacturing facility at Bidadi in the state of Karnataka. The award winning technique involved the use of a psychrometric controller method, ideated and executed internally, to regulate temperature and humidity which eventually led to reduced energy consumption. TKM, as an environmentally committed corporate, implements various eco-initiatives in its manufacturing operations, effectively contributing to establish HARMONY WITH NATURE. This award recognizes such energy-efficient methodology implemented to meet vital eco-challenges. More than 65 companies participated in the category which recognizes improvement in equipment effectiveness with an emphasis on proactive and preventative maintenance in production line, markedly increasing plant output whilst increasing employee morale and job satisfaction. The Toyota team has stood first successfully clearing this Kaizen competition held at zonal level (North Region Level), going on to compete to be the “Best of Best” Kaizen Champions at the National level which is scheduled to be held during Sep ’17. Total Productive Maintenance (TPM) system at TKM ensures overall synchronization of machines / equipments, processes and employees through smooth integrity of Production & Quality systems that add business values to an organization. Our Toyota philosophy focuses on the relentless problem solving involving people & developing the Kaizen Culture. We are honored to receive the award as an acknowledgment to our dedication for continuous improvement in efficiency and production quality. The commitment to go above and beyond building just word-class cars and following a more sustainable production process with minimal environmental impact is deep rooted in the Toyota culture. As a socially responsible automobile manufacturer, Toyota is proud to play a vital part in promoting a greener and healthier future. We do not limit such responsible practices to our plant, but also integrate & impart our best practices by engaging dealer supplier partners, thereby enhancing the overall effectiveness of operations. CII Kaizen Conference & Competition is a renowned platform that honors best practices and continuous improvement of processes in the fields of manufacturing, engineering, supporting business processes, and management across industry verticals, aiming to share best practices of different corporates and to enhance individual’s capability. Every year a total of 4 winners are selected from under four categories (Restorative, Renovative, Innovative & Breakthrough) to carry the best kaizen award in the form of a trophy.